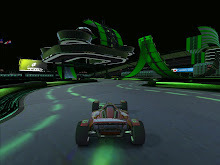 FNG - Friday Night Gamers (Utah): GEEX 2010: TrackMania Tournament Dedicated Server is Live! GEEX 2010: TrackMania Tournament Dedicated Server is Live! The Team FNG practice server for the GEEX 2010 TrackMania United Forever tournament is officially live, and will remain so until GEEX is over. Mind you, it's still a test-bed for the tournament tracker app I'm writing to keep score during the GEEX tournament. This won't affect your gameplay, except for seeing scoring at the end of each race (and being able to type /rank at any time to see your current tournament standings.) Note that this will only work when I have the tracker app running... which will only be when I have time to work on it. We may or may not run some mock tournament runs with the app if I have time to do so; but most of the time when you see it running, I'll be making tweaks and fixing defects with it, so you'll have to bear with me when the scoring keeps resetting, etc. Tonight, I'll be making the scoring reports show the players' aliases instead of their logins and working on a couple other things. Feel free to practice on the server whenever you wish. If it's not up, come back here and leave a comment so I can be notified about the outage. I'll get it fixed as soon as I can. I look forward to seeing you all at GEEX and spending some time racing with you before the tournament. I'll hopefully be getting the in-game news submitted this weekend. So go practice away and let's make this a spectacular tournament! Does Starcraft 2 Contain a Diablo 3 Easter Egg?